"A Tale of Two Santas" is the thirty-fifth episode of Futurama, the third of the third production season and the second of the fourth broadcast season. It is the second seasonal episode. It aired on 23 December, 2001, on Fox. It guest-stars Coolio as Kwanzaa-bot. The crew attempts to defeat Robot Santa and return Xmas to what it was in Fry's time. 1.1 Act I: "I'll let you punch me for a buck." 1.2 Act II: "No human could do all that!" 1.3 Act III: "Bender can't be Santa!" 1.4 Act IV: "Stop the Execution!" 1.5 Act V: "Ho! Ho! Ho!" Act I: "I'll let you punch me for a buck." After a stern warning from Walter Cronkite, the crew works hard to secure Planet Express against Santa. The Professor shows off his bulletproof shutters, and tells the crew they'll be safe as long as they don't leave the building. He then sends the crew to deliver a sack of letters directly to Santa on his Death Fortress on Neptune. On the trip, the crew read a few of the letters. They all refer to the violence that Santa wrought last year. Fry and Leela decide it's time to defeat Santa to bring back the joyous Xmas of Fry's time. Upon landing, they are approached by malnourished Neptunians who are actually Santa's little helpers, and apparently desperate for food and money. They also hold each other's hands constantly, for unknown reasons (unless you listen to the commentary). Bender mentions toys, and the Neptunians reveal that, since Santa judges everyone to be naughty, the toy factory is out of service. The crew asks for volunteers to help them infiltrate the fortress, and one Neptunian wants to help. The Neptunian holding his hands is also unwillingly volunteered. Santa is checking his video monitor, looking for naughty people. He judges the act of beating a shopkeeper for not paying his protection money to be equally naughty as the shopkeeper not paying his protection money. Scruffy is also judged naughty for scratching his nose. The Neptunians bring in the sack of mail. Act II: "No human could do all that!" Santa turns off his monitor with a warning to the Neptunians, who flee. The crew emerges from the mail sack, and Leela attacks Santa with a logical paradox, which causes his head to explode. Santa's head, however, was built with paradox-absorbing crumple zones. The crew runs, and Santa pursues them with a large missile launcher. The crew runs into an elevator just as Santa fires, and the missile gets lodged in the doors. As the elevator moves, it shears off the warhead, and the crew is trapped inside the elevator with it. When the elevator reaches the ground floor, the crew runs, Leela carrying the warhead. When she realizes her mistake, she drops the warhead and continues running. The crew boards a sled, and with the help of the explosion from the warhead, they are propelled down the hill toward the ship. Leela tries to take off, but Santa has meanwhile grabbed onto the engines, halting their progress. The exhaust from the engines melts the ice, and Santa sinks into the water. As Leela shuts down the ship, the ice re-freezes and Santa is trapped. The Neptunians rejoice, as they can finally start making toys again. At first, Fry volunteers to deliver the toys, but the task would be impossible for a human. Bender reluctantly takes the job. Act III: "Bender can't be Santa!" Bender takes to the job easily enough, though, commanding the Neptunians to bow down to him. The Neptunians break into song and start up the factory again. They make many toys, whose quality is low due to time constraints. Bender is painted red to disguise himself as Santa. Using Santa's hoversleigh, Bender arrives on Earth only to be blocked from his first chimney by a set of bars. Luckily, Bender's a bender, and he easily bends them. He offers the family inside Tri·Ominos, but they don't trust him and attack him. A damaged Bender tries the next house, and is waylayed by Petunia. She attacks him with a flamethrower, and he is eventually blasted back out the chimney. On the way to the next house, Bender meets up with Kwanzaa-bot. Bender asks for help, but Kwanzaa-Bot has no time, as he must give out the traditional Kwanzaa book. Back at Planet Express, the crew prepares for Xmas. Fry tries the egg nog, but finds Zoidberg bathing in it. Leela reminds the Professor that Bender is Santa. He tells her she sounds like a broken Mp3, but less than two seconds later, when Bender drops through the fireplace, the Professor opens fire with his shotgun. A badly mangled Bender then dumps the toys into the sewer, which offends at least one mutant. While Bender is celebrating his genius with a drink, Smitty and Url corner him. Being mistaken for the real Santa Claus, Bender is brought before Judge Whitey to be tried for his "crimes". The Hyper-Chicken is the prosecuting attourney in this case, while Bender chooses to represent himself. Judge Whitey finds Bender guilty, and sentences him to execution at sundown. Bender is hauled away. Act IV: "Stop the Execution!" At Stattica Robot Penitentiary, Bender is brought into the execution room. Meanwhile, the PE crew returns to Neptune to take the real Santa to Earth to prove Bender's innocence. However, after cutting the block of ice out of the ground, it begins to melt. The newly-reopened factory has been pumping out greenhouse gasses which have heated the atmosphere. Santa attacks, and the PE crew is forced to escape the planet without Santa. However, unbeknownst to them, Santa has stowed away on the ship. At the penitentiary, Bender is strapped into the Magnexecutioner by Mayor Poopenmeyer. He begins a countdown which may or may not ever reach zero (a random number generator). Before the countdown can complete, everybody from Planet express enters dressed as Santa, except Zoidberg, who for some reason is dressed as Jesus. However, the mayor doesn't fall for their ploy. Act V: "Ho! Ho! Ho!" The random number generator reaches zero, and the electromagnets fire up, tearing Bender apart slowly. His inhibition unit is disabled and he begins to sing. Just before he is torn completely apart, the real Santa breaks through the wall and destroys the Magnexecutioner. Bender fears for his life, but Santa reveals that he actually needs Bender's help to finish the Xmas rampage. Bender agrees to help, and they both leave. Much violence ensues, though most of it is merely property damage. Back at Planet Express, the crew is huddled together for warmth, and Fry realizes that fear has brought them together. Bender and Santa run into Kwanzaa-Bot, who invites Bender to Chanuka Zombie's luau at the B'nai B'rith. Before he can leave, Santa gives Bender a present, which turns out to be empty. 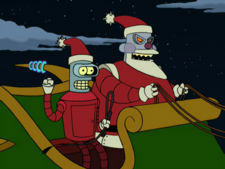 Santa warns Bender that if he impersonates Santa again, he'll be killed. Santa then ejects Bender from the hoversleigh, and flies away, leaving the city in ruin. John Goodman played Santa in "Xmas Story", but he was unable to return, so John DiMaggio played the part. Dan Castellaneta was unavailable due to his work on The Simpsons, so Maurice LaMarche provided the voice of the Robot Devil. Prof. Farnsworth: Bring it on, Santa! That bloodthirsty cadaver junkie can't touch us as long as we're not stupid enough to leave this building. Prof. Farnsworth: In a related matter, you'll be delivering this sack of children's letters directly to Santa at his Death Fortress on Neptune. Mayor Poopenmeyer: How dare you lie in front of Jesus?! Mayor Poopenmeyer: Get 'im, Jesus! 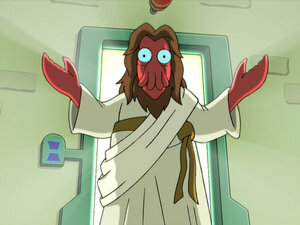 Dr. Zoidberg: [Dressed as Jesus.] I help those who help themselves! Prof. Farnsworth: Yes, yes, yes. You sound like a broken MP3! Hyper-Chicken: I'm sorry, I thought you was corn. Judge Whitey: Quit badgering the witness! Santa Claus: I'm dreaming of a red Xmas. Ho, ho, ho! Mayor Poopenmeyer: Ah, good old Maggie! When I pull this switch, these powerful electromagnets will tear you limb-from-limb, killing you in the most humane possible manner. Bender: But, Mr. Mayor, that doesn't sound humane! Mayor Poopenmeyer: It is for the witnesses because it's not boring! When we see the Robot Mafia beating a shopkeeper on Santa's video screen, Clamps is wielding a rather stiff dead cat as a weapon. This may be a reference to Simon Bond's book 101 Uses for a Dead Cat and its sequels. When Leela is trying to destroy Robot Santa with a paradox, she does it in a very similar way to James T. Kirk in the Star Trek episode "The Return of the Archons" as he is using the paradox to destroy the computer. During the musical section in the toy factory, Leela turns the factory machines' speed to "Lucy" which is a reference to the I Love Lucy episode Job Switching. The "I'm Santa" sequence is a reference to the Stanley Kubrick film Spartacus. When Bender is found guilty of being Santa he is sent to "Stattica Robot Penitentiary" a clear allusion to Attica correctional facility in New York State. Leela's "logical paradox" is not truly a logical paradox. It requires that Santa believes those he's judged naughty are not in fact naughty. But he clearly thinks they are, so no paradox is created. A true paradox might sound something like this: "This sentence is untrue." This could be explained, however, that Leela thinks Santa would see himself as naughty as he takes every wrongdoing as being bad, however minor or justified, including the previous scene where the shop owner refused to pay protection money, so he would see his own killings as 'naughty', despite strongly believing that they are justified. Petunia is barefoot when Bender first enters her apartment, but is wearing high heels when she shoots him with the flamethrower. When Mayor Poopenmeyer stands next to the electro-magnet execution machine, several items seem to be pulled from his coat pockets humorously, because of the magnetic pull of the magnet. This shouldn't happen because the electro-magnet is not on. If the magnet had been turned on before, it will still carry a small charge through the magnets. The remaining half of the execution machine should affect Santa and/or his robot reindeer since it is still active before he blows it up. There are non-magnetic metals (most of them, actually) and alloys, so it's possible the 'Yuletide specifications' Santa says he's built to only permit those. When the elves bring Santa the mail their hats are ripped by the buzz-saws extending from the sign. However, their hats are intact in the scene when Santa turns off the TV. When Kwanzaa-bot shows Bender the book about Kwanzaa, it's incorrectly spelled "Kwanza". Everything that happens on Neptune is impossible, because Neptune is a gaseous planet. 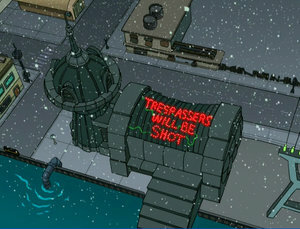 Because of this, Santa's workshop shouldn't be based there, and the Planet Express Crew wouldn't be able to land there. This page was last edited on 4 July 2017, at 05:21.